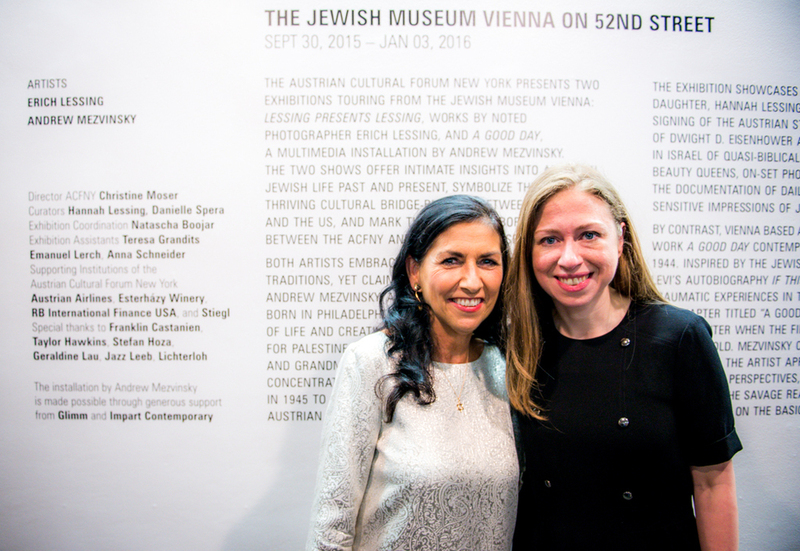 "The Jewish Museum Vienna on 52nd Street" marks the first collaboration between the ACFNY and the Jewish Museum Vienna. The show, curated by Hannah Lessing and Danielle Spera, was inaugurated by Austrian Federal President Heinz Fischer and Federal Minister for Foreign Affairs Sebastian Kurz. Among the distinguished guests, ACFNY director Christine Moser was delighted to welcome Chelsea Clinton together with her husband Marc Mezvinsky, brother of the artist. Andrew Mezvinsky is a young American artist, based in Vienna, and a master of delicate design. He creates series of drawing, which he animates, depicting Holocaust survivor Levi's traumatic experiences in the concentration camp. Erich Lessing is one of the most notable Austrian photographers of all times, he documented the signing of the Austrian State Treaty in 1955, the Hungarian uprising in 1956 and many more. Lessing and Mezvinsky on display in one exhibition is a vital symbol of the ongoing, thriving cultural bridge building between Austria and the US. The two continents, the Old and the New World, the past and the current century, young artist and old master have moved a little bit closer together. The exhibition will travel to Washington, DC in January 2016 and will be shown in the Austrian Cultural Forum Washington, DC.